I have tested around for a couple of days, with an Wemos Esp8266, and an Arduino Nano as Gateway and a ProMini with dht22 as Node. I had no Chance to get them to work (gateway not responding), now i read, that i must switch back to 2.0.0 and everything is really fine (first try, success). Is that a known Bug? Why is it not getting fixed? without much infos (debugs logs etc..) it's hard to help. As far as i know, rfm69 is working well with the latest Mysensors development branch at github..
the log is in this case not very usefull, because they start up normal, with or without rfm69 attached. The node try's to find the gateway "No Reply" but is it not answering. I have tried some different szenario's... if they are paired with 2.0.0 i can update the node to any newer version, but not the gateway. The Gateway is not answering when it gets a newer version. When its not paired, no chance to add new nodes with newer versions. Well, that would explain why some time back I could not get RFM network to work. After a week of reading and changing sketches, and trying to figure it out I give up (got the same "No Replay"). Not tried with an older version, but got one instance when gateway found the node and then immediately hanged, after that nothing. I guess that I should check again with an older version then. that should be the Same Problem, as i tried to explain above. @Floca I have just tested RFM69w with the development branch and that works great. Don't know if the code is different from c versions though. It was very important to have the right declarations as described in the radio section. 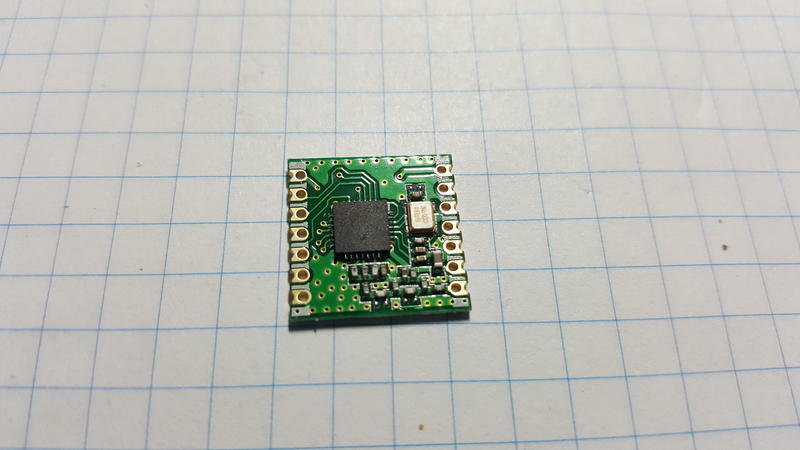 I have declared, that i want to use RFM69CW instead of NRF24 and have nothing else changed. I dont know, if there is an difference between the C an non C Versions of the Module. // #define MY_RF69_SPI_CS 15 // If using a different CS pin for the SPI bus. Use MY_RFM69_CS_PIN for the development branch. But i guess you are fine, since you are not using H version unless your wiring is ok.
Ok, i have seen this defines and used them (without the define for the HW Module, because it is only for that), the Result was 1:1 the same as without the definitions. 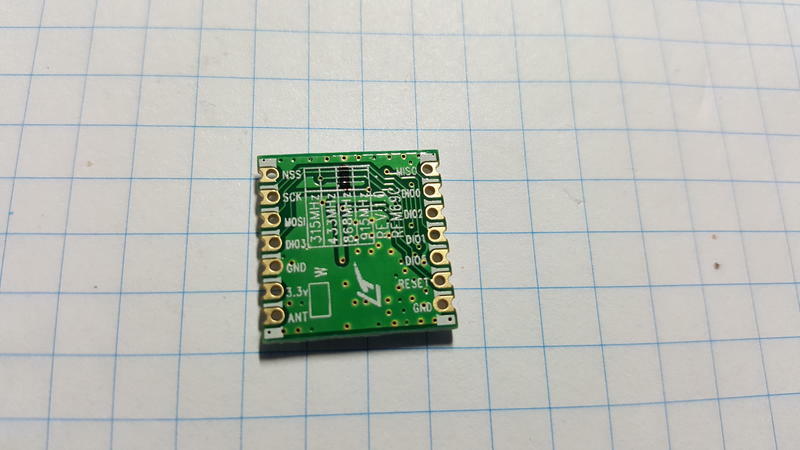 Can you post a picture of het back of your RFM module? That way we can eliminate the definitions you won't need. I run on 2.1.1 with 868MHz versions of both HW and low power. No problems whatsoever. I'm getting very curious as to why I keep reading about users facing issues with the RFM based nodes. Hi, I will look closely this, because I would really like to get RFM network going for my outide, not with NRF reachable sensors. cause my radio was like 4th from left in the picture below. I was using antenna bundled with radios (173mm) stranded but changed to solid but with the same length. Well there's your problem! You have a 868MHz CW version. So NOT the HCW That means both of the above mentioned defines ar not valid. The only define you'd have to make is #define MY_RADIO_RFM69. That should work. You can tell that it is not the H version because of the missing components that make up the extra RF amplifier on the module. Take a look in the posted Scripts, all definitions are excluded, that are belong to the H Version. I think @DavidZH was confused by @archiijs post about the H version. I double-checked your sketches and none has the definition for H so now that's out of the way at least. @Floca could you post debug output from the gateway and the node (preferably from the same time) ? Also, just to double-check, have you made any modifications to MyConfig.h or are you using the untouched original version? Yes, sorry for this, I will stand back til @Floca gets his problem (and maybe mine) figured out and then jump in to avoid confusion, sorry again. The Config is the Standard Config which comes with the Package on Github. The Scripts from above are used to flash the devices. The Gateway on 2.2.0-beta gives only these lines as in Codebox, then, nothing else happens. I tried a few weeks ago rfm69 with atsam, esp32 etc and was working well here. So I'll take a look asap. Need to find a wemos to have same setup. in your first post, you say that you tried with a nano. But nano is 5v whereas rfm69 is not 5v tolerant. So this can't work. I use Arduino PRO MINI's 3.3v for my Nodes. I'll dig out some modules and see if I can reproduce the problem. @Floca which pins (GPIOxx or Dx) do these correspond to? MySensors is not able to initialize the radio, probably due to my wiring not being the same as yours. I've spent 2 hours and I can't even get gw+node working on 2.0.0. I'll take a break and try to clear my head so I can figure out what is wrong. ...on 2.0.0 or on 2.2.0? I can't do any troubleshooting unless I know I have a working configuration. Troubleshooting 2.2.0-beta with a configuration that I know is broken on 2.0.0 it totally useless. Ok, i know what you mean, that is true. I have researched and have found out that an arduino nano as a serial gateway also does not seem to work (same log as above). @Floca - A nano will fry your radio (5v SPI/data lines) but maybe you wrote the wrong mcu? I can comfirm that a RFM69w and Pro Mini 3.3v 8mhz works great on dev branch. A nano will fry your radio (5v SPI/data lines) but maybe you wrote the wrong mcu? @Floca which controller do you use ? I have a gw and two sensors working great. @Floca good maybe the issue is rfm+vemos but which controller do you use? Oh you mean which System uses the Data? @Floca I'm not familiar with fhem but I guess that controller hands out Id? I think FHEM hands it out, yes, because you can configure the ID's in the Mysensors Module. ...with nRF24 the beta is no Problem with FHEM. @Floca I now have working nodes with 2.0.0. Unfortunately (at least for this troubleshooting) they also work with 2.2.0-beta. The only difference I see is that my radio modules are for 433MHz, while yours are for 868 (which is default). I don't see why it should matter, but it is a difference. The same commit as i used, freshly downloaded yesterday. Is that ok for the Gateway? @Floca what happens if you declare it? It is grey, uploads it and same thing as before. Sensor cant get the gateway, gateway stops at "pm open,type:2 0". and never receives any messages. I even had to restart the node after a flashed the gateway with IRQ_NUM defined. Before I restarted the node it wasn't able to get the transport up and running again, showing repeated !TSF:SND:TNR. When it is gray, the define is not found, am i right? What would you think? Arduino IDE reinstalling or what could be the problem? But what you did before, with setting both to D2, should work. Could you try that again, and reset the temperature node after you have uploaded the new sketch to the gateway? Ok, i delete the eeprom from both, gateway and node and flash the old scripts with additional definiton of Num IRQ for the gateway? @Floca That there should be no need to clear the eeproms, and no need to re-flash the temperature node. Just flash the gateway with the IRQ_NUM set and restart the temperature node. My node and gw have been working throughout the night. is there a chance to get your library Folder? @Floca sure. I'm abroad now but I can zip it up when I am back home. @mfalkvidd That would be great! Your test Module for the Gateway was an Wemos, an NodeMcu or something else? as mentioned by @mfalkvidd Thanks!